(Jeremy Harmon | The Salt Lake Tribune) Police officers in Utah submit thousands of search warrants a year to judges, who are tasked with reviewing the paperwork and determining whether there is a probable cause to believe a crime has been committed. If so, the judge will authorize the police officer to make the requested search. 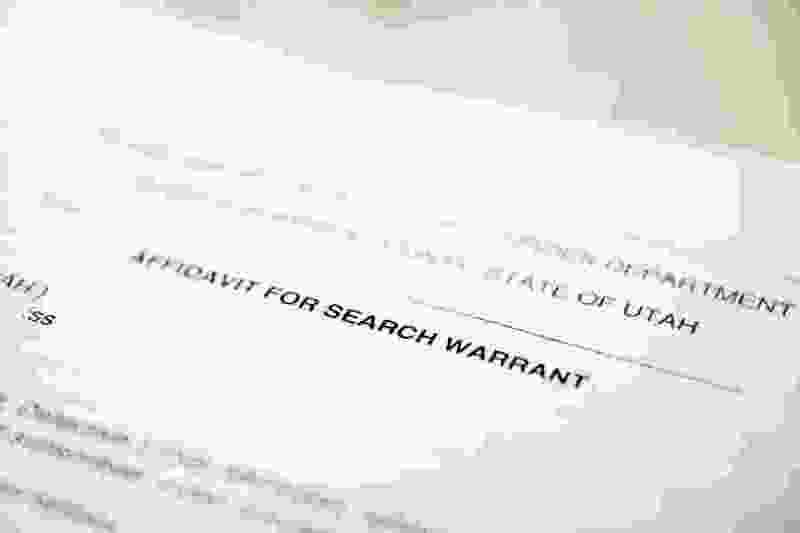 It took Utah judges less than three minutes to sign off on more than half of all search warrants submitted by police in the past year. Those warrants could be for everything from permission to draw the blood of a suspected drunk driver to authorizing the forcible search of someone’s home to permission to track a suspected drug dealer’s cellphone. Judges approved nearly 9,400 warrants during a one year period starting in April 2017, according to state data acquired through a public-records request by the Libertas Institute, a libertarian-leaning Utah think tank. The overall average time a judge spent reviewing the warrants was about eight minutes, but nearly 60 percent were given the green light in less than three, and 3 percent were approved in under 30 seconds. The new, detailed data — which gives a better idea of how long a judge views a warrant before signing off — has groups like Libertas and defense attorneys concerned that judges have becoming too hasty. But court officials say judges are doing thorough reviews before making the important decision of whether there’s enough evidence for a warrant to be granted. The Salt Lake Tribune reported earlier this year that half of search warrants in 2016 were approved in 10 minutes or less. This number was based on a timestamp identifying when an officer submitted a warrant and the time when the judge approved it. The most recent data is more detailed, and includes a timestamp of when a judge began viewing the document. Utah’s e-warrant program began a decade ago, and was praised then as a timesaver that allowed warrants to be approved in just minutes, as compared to what could be hours since officers previously had to spend time traveling to see a judge in person to get a signature. To get a warrant, police officers are required to fill out a template that includes a description of their law enforcement credentials and why they need access to whatever they want to search. After they submit the document, an on-call judge receives a text or email alert, which can come at any hour. In Utah’s 3rd District Court, which covers Salt Lake and Summit counties, Blanch said he is assigned to be the on-call judge for a week about every eight months or so. He’ll get warrant requests through his email during work hours, and after-hours requests come by text. During that week, he said, he changes his ringtone to something like an “air raid siren” so he won’t miss any late-night requests. Blanch said judges usually try to respond within a half hour after an officer submits the paperwork. Every warrant is different, he said, but he usually can review the documents for five to 10 minutes before he decides to sign a warrant. He’s looking for “probable cause,” a legal standard which he explained as an officer showing just enough evidence where a reasonable person would think a crime was likely committed and the officer would be able to obtain evidence of that illegal activity. If Blanch believes the officer has shown there is enough evidence, he clicks an icon — a little green thumbs up — and the warrant is approved. If there’s problems, he clicks a red thumbs down, and he can send comments to the officer explaining why the warrant wasn’t approved. It’s rare, however, for a judge to turn down an officer. Only about 2 percent of proposed warrants were denied in the past two years, according to state data. Critics, including some defense attorneys, have raised concerns that the latest data showing quick review times may be a telltale sign that judges aren’t carefully reading and digesting the information before hitting the approve button. Steve Burton, the president of the Utah Association of Criminal Defense Lawyers, said defense attorneys have long been concerned about this issue. Libertas President Connor Boyack said the new data leaves his organization with more questions than answers. There are instances, he said, when the warrants are very short or the case is simple, and judges might be able to review them in 30 seconds or less. But then there are cases that are multiple pages detailing a lengthy investigation that are being approved in the same amount of time. In one warrant, for example, a Davis County judge spent just 26 seconds in October 2017 reviewing a nine-page affidavit before permitting an officer to search a massage parlor suspected of prostitution. Another warrant, a 5-page affidavit submitted last June, was viewed by an Ogden judge for 34 seconds before he allowed a Weber-Morgan Narcotics Strike Force officer to place a GPS tracker on a suspected drug dealer’s car. But Blanch and other court officials say there are scenarios that could explain the short turnaround times on lengthier warrants. If the judge already read the warrant and denied it, it would not take long to review it a second time for the needed changes. Or if an officer is requesting multiple warrants as part of a large investigation, he or she may have the same facts in each affidavit. Rick Schwermer, Utah’s state court administrator, said there is already a check on the current system: Once a case is before the court, a defense attorney can file a motion challenging whether there was probable cause to warrant a search. Those challenges are rare, Schwermer said. Several judges he spoke with had never seen a motion like that; Blanch said he’s had two in the six years he’s been on the bench. But Burton, the defense attorney, said it can be a tough task to ask a judge to rule a colleague was wrong and improperly approved a warrant. The likelihood of success is so low, he said, and it’s oftentimes not worth the trouble. With the new data, Burton said he anticipates more defense attorneys will review approval times on warrants and more challenges could be coming. But he said he’s more concerned about those cases where warrants are being approved for home searches and police find no evidence of a crime. Those people will never make it to the court system or to the point where a defense attorney could challenge the search. “It’s the innocent who are supposed to be the most protected,” Burton said. Boyack said his organization would like to see some change to increase judicial oversight and transparency. There is a possibility Libertas will push the issue during next year’s legislative session, he said, but he hopes to discuss their concerns with the courts first.